The team made up of Julian Landin, Matthew Eynan, Andrew Hiesinger, Spencer Schmidt, and Mason Theurer pose for a photo after winning the annual Orange, Osceola, and Seminole County Regional Envirothon 2018 at Harry P. Leu Gardens, Orlando, Florida, February 7, 2019. Students competed as 5-member teams. Awards recognized the top teams from each county and an over-all winner. 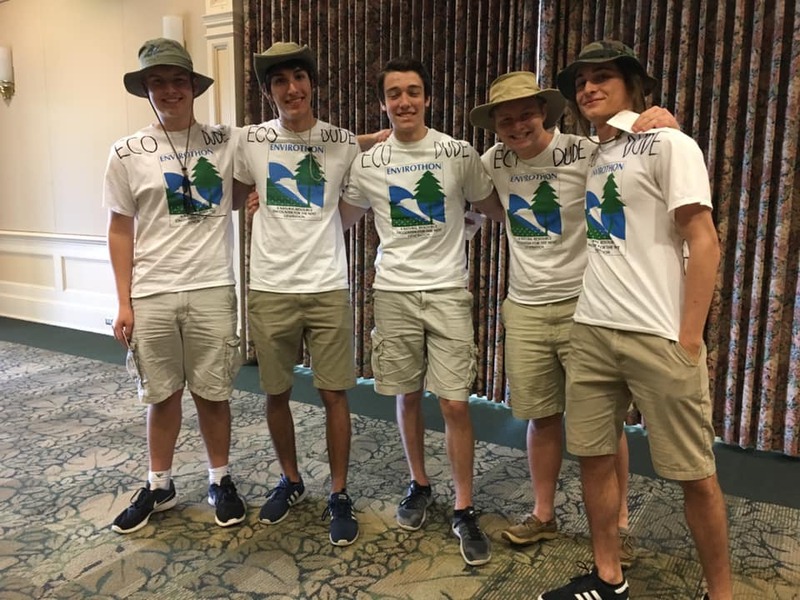 Students from Celebration High School in Osceola County have placed first for the third year-in-a-row in the annual Orange, Osceola, and Seminole Regional Envirothon competition held February 7, 2019 at Harry P. Leu Gardens in Orlando. The 5-member winning team was made up of seniors Julian Landin, Matthew Eynan, Andrew Hiesinger, Spencer Schmidt, and Mason Theurer. Envirothon is a hands-on, natural resources educational program for high school students held nationwide, including in Central Florida. During the field event, teams work together to answer written questions and conduct active-participation projects focusing on environmental issues. Lorie Thuesen has advised and trained local teams from Celebration High School for 14 years. One of the several sponsors of Envirothon is Toho Water Authority. Forty-four teams from 14 high schools in the three counties participated in this year’s competition. “Many students have never seen the inside of a tree trunk or understand the negative impact of evasive, non-native trees on plant diversity,” said Dana Sussmann, senior forester, Florida Forest Service, who works in four Central Florida counties from an office in Orange County. A total of 176 high school students rotated between five stations situated in areas around Leu Gardens. Each stop posed a different challenge in the topics of aquatics, soils, forestry, wildlife, and rangeland. Some of the activities included identifying soil types, recognizing non-native evasive plants, and answering multiple-choice questions. The high schools received study manuals and guides months in advance to allow preparation time. The winner of the regional competition is eligible to send a team to the Florida state event and then represent Florida at the North American Envirothon in July, 2019 in Raleigh, North Carolina. The OSWCD Board of Supervisors meets in the University of Florida Extension Services Office at Osceola Heritage Park. Meeting notices and information about its work is available at www.osceolaswcd.org or call (407) 847-4465 Extension 3 and mobile (765) 444-7713.